The final schedule should meet all of your requirements. Turbo Planner enables you to check the computer generated schedules semi automatically, automatically or manually. You can move individual periods of tuition to other times. 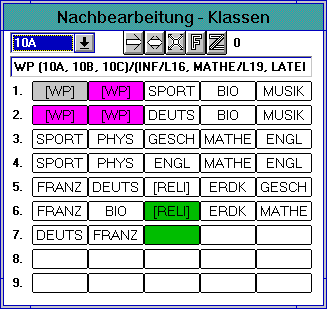 Other timetables are displayed on the screen in order to provide you with additional information. Turbo Planner displays the exchanges that can be made, and provides you with, among other things, an extensive overview. You can, for example, let the program display the individual groups that contain errors and jump to that specific section. Figure: Active window for checking. Here you see a timetable, while it is being checked. The colors show what is locked and where exchanges can be made in respect of the selected lesson. You can display the classes and teacher schedules that form part of it in auxiliary schedules. If required you can open a new window and view individual errors, errors that cannot be eliminated and visual errors. You can jump to the specific section immediately by simply selecting the relevant item. All windows will be updated at the same time. You can also see whether your amendment rectifies the error.